In this page you can find some information about our history, the certification we can provide to the customers, and the certifications held by the Company. PNR Italia was founded 1968 as a trading Company for the sale of parts and components for fire-fighting systems. Company Headquarters and sales offices were located in Milan. At that time, it was only a commercial unit with no manufacturing facilities. New shareholders joined the first owners. The first manufacturing activities started in a workshop in Milan. Company Headquarters and manufacturing facilities were moved to Voghera, via Gandini 2, in a building enclosing offices, workshop and store. A new building was built on the same property next to the first, increasing the manufacturing surface (covered) from 1.000 m2 to 2.500 m2. A new adjacent ground was bought and the total surface was increased from the initial 6.000 m2 to 20.000 m2, where a new manufacturing facility was built. The new plant enclosed production halls, offices, store, labs and a testing area. The property was extended with the purchase of more land that brought the total covered surface of the site to 6.000 m2. PNR Italia started as a trader of components for the fire-extinguishing systems but, in the following years, started to design and produce nozzles for the fire-fighting sector first and then extended its activities by manufacturing a wide range of spraying nozzles and systems for applications in almost all types of industry. Our portfolio ranges from all types of spray nozzles, wash heads and atomizers to more complex and tailored spraying units and devices. The result of a long experience and a vast know-how in fluids dynamics, design, and manufacturing. Throughout our history, we have successfully served a wide variety of industries all over the world. We can supply our products through a global sales network of PNR commercial branches and Distributors. We are focused on delivering innovative and technology-based solutions to respond to the changing needs of customers, while maintaining our commitment to tradition and Italian quality. Statement of compliance with the order, with indication of results of non-specific inspection. – References to the technical specifications CLC/TR 50404:2003. Declaration stating that the materials (AISI 316L or PTFE) used for manufacturing the products fall within the list of the FDA and CE 1935/2004 approved food grade materials. Origin declaration of the product(s): the items produced by PNR are 100% of Italian origin. Functional, dimensional and visual test of the product(s). Statement referred to instrumental analysis (practicable only on external and non-spherical surfaces). A diagram that indicates the variation of capacity and spray angle for different pressures. Depending upon the nozzle design, variations of feed pressure may have a great influence on the spray angle value. This test is made with a measurement optical system. Spray coverage depends on the amplitude of the spray angle, on the distance between the nozzle orifice and the target to be covered, and on the pressure. The actual values can differ a lot from the theoretical values. This test can give a precise information about how evenly the drops of the spray are distributed onto the area covered by the spray. The water distribution along the spray coverage is determined by means of an instrument called “Patternator”. PNR droplets size test reports are performed by means of a Laser Interpherometer (PDPA – Phase Doppler Particle Analyzer), where two laser beams cross in a given point of the spray and define a test probe area. Droplets flying through the probe area cause a light scatter which is picked up by the instrument receiver and processed through a computer, in order to obtain relevant information about the spray characteristics, such as Sauter Mean Diameter, distribution curve of droplets diameter (micron), distribution curve of droplets velocities (mps). Test made on spray nozzle can be performed also on air blowing nozzles (model UEA and UEB). Both ultrasonic atomizers and air blowers produce noise, therefore we can produce a diagram of the noise level for different working pressures and distance. Our own made descaling bench test allows us to give the client precise information on descaling nozzle, such as impact pressure (maximum and average), area of impact (three dimensional), overlapping coverage. For our tank washing heads (fixed, reaction drive, high impact) we can determine both the wetting radius (the radius where the equipment can wet the entire tank inner surface) and the washing radius, which depend on the product to be eliminated, the cleaning fluid, the operating pressure and temperature. Depending on the request of the customer, we are available to settle any kind of test, in order to provide all the information regarding our products. 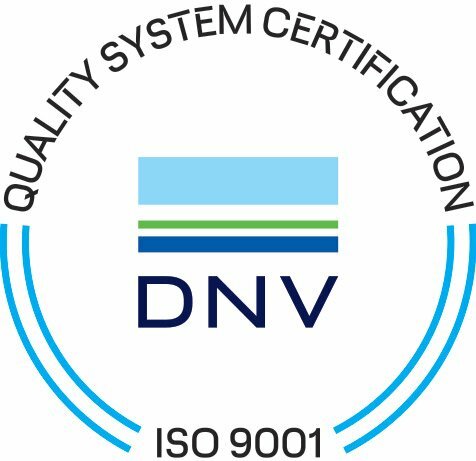 The Quality Management System of PNR Italia is certified by DNV-GL according to the UNI EN ISO 9001:2015 standard. PNR Italia srl is authorized to use the 3-A Symbol to the tank washing head code UA3 xxxx B31 xCx, conforming to 3-A Sanitary Standard 78-01 (Spray Cleaning Devices Intended to Remain In Place). Single-axis rotary spray balls UBA, UBC, UBD, UBF, UBF-A, UBF-S are available in ATEX (“Atmosphères explosibles”) version, in confomity with European Community Directive 2014/34/EU that determine compliance with the essential safety requirements for equipment and protection systems intended for use in potentially explosive atmospheres.